On An Overgrown Path: Whatever happened to folk music? Whatever happened to folk music? This brings up the subject of how anything "folk" is perceived by the supposed musical elite -- both music and instruments. See: John Jacob Niles, for instance. The only exception to this seems to be if it comes from somewhere else -- i.e., the performer is always been if they're from a long ways away. "Folk" instruments are respected if, say, they're a Shakuhachi, but not, say, the nearly identical Native American instrument. I guess it's because the assumption is that "folk" music and instruments aren't "educated" properly, and therefore can't possibly contribute anything to the realm of "proper" music? I don't know. All I know is that the best composers pretty much all appropriated folk tunes and sometimes folk instruments...even Mozart. AS, it is a good point you make. We are all guilty of overlooking folk musicians. For instance, missing from my recent thread on musicians as novelists was Woody Guthrie, who is seen in my header image. In 1946 the folk singer wrote the 400 page mystical novel titled Seeds of Man. Initially the book failed to find a publisher; but it was eventually published in 1976, ten years after Guthrie's death. As well as writing iconic songs including This land Is Your Land, Guthrie was a major influence on musicians including Bob Dylan, Pete Seeger, Peter Paul and Mary, Joan Baez, Ramblin' Jack Elliott and of course his son Arlo Guthrie. 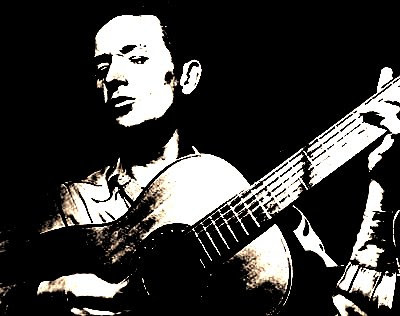 Woody Guthrie lived from 1912 to 1967, and there are only two brief film clips of him. Another folk singer, Nick Drake, lived from 1948 to 1974, and there is no film footage of him at all. I have to say, Joan Baez has brought me to tears on occasion, and I am not a sentimentalist. I ran across a collection that had her singing some of J.J. Niles' religious settings, and it was heartrendingly lovely and melancholy, both. I was born and raised in an area not far from the Appalachian region in which Niles did his work, and IMO, Joan Baez came the very closest I've ever heard to making his music sound so very right -- it's like the real thing, only perfected. Another folk genre I dearly love is the sacred harp/shaped note singers. It's an acquired taste, for certain, but it's similar to inuit throat singing -- best if you put away your notions of what music is or should sound like. It's worth mentioning Bruce Springsteen's Seeger Sessions (CD, DVD, and lots of YouTube clips), which is as vital a rethinking of folks songs as I've heard in a long while. The second Guthrie clip seems to have vanished for the moment - John Henry, with Sonny Terry and Brownie McGhee. But to be serious for a moment (may I?) - interest in folk music comes and goes. It never dies completely, and it never really goes "mainstream," the exception being the folk boom of the late 50's/early 60's. In some ways, the "public position" of folk music is somewhat similar to that of jazz, I think. The enormously talented young folk-singer and harpist Joanna Newsom (who has garnered literally reams of critical raves) cites Ruth Crawford-Seeger as one of her biggest influences. I'm not sure I can actually hear it, but still... Folk music has actually had a gigantic resurgence amongst adventurous listeners and performers in the last several years, with countless young singer-songwriters expanding the genre's parameters with all kinds of world music and modern classical influences; folks who are just as likely to reference Terry Riley as they are Neil Young. We just spent a month in a vitriolic argument about whether we should teach 'folk' guitar or 'classical' guitar at our free music lessons for inner city children. The argument being that if we teach 'classical' violin and piano, shouldn't we teach 'classical' guitar for consistency? Our music director finally stepped in. He said 'classical' guitar is a style and that first our students need to learn the basics--then let them choose a style. In the community we serve 'classical' is such a loaded concept. I suspect 'folk' is unexplored territory. There was a protest song in the 60's which is proving extremely elusive! It was titled "Peace" and recorded by The Wedgewoods. It made such an impact on me at that time that I can still recall many of the lyrics (see end), however, searching by Wedgewoods and even by lyrics is proving futile. If I recall correctly, they recorded on the Pye label (although not sure)Any thoughts?